About 10 years ago I was working with a man who worked shiftwork at a factory. His schedule had him rotate between two weeks on a 12-hour day shift and two weeks on a 12-hour night shift. Although he said he was used to it, his work had an impact on his health. But it wasn’t the two weeks of being a night owl that hurt him; it was the rotation. Turns out, if your sleep is not consistent, that’s when staying up all night can lead to health problems. When you don’t get enough sleep or don’t keep to a regular schedule, it’s taxing on your body and it can increase your risk for cardiovascular problems, weight gain, depression, gastrointestinal problems, and overwhelming stress. You may be more likely to cause or be involved in accidents, too, which is a definite threat to your well-being. When it comes to your overall health, sleep quality is key. Your circadian rhythm, in simpler terms, is your sleep cycle. It’s largely synchronized by light and melatonin, but genetics can play a part, too. Some people might be wired to be up later in the evening and sleep a little deeper into the day. For example, there is proof that teenagers need to sleep for more hours compared to other age cohorts; therefore, the stereotypical situation of mom trying to wake her teen for school after they’ve already hit “snooze” a few times makes sense. That said, for some, this trend can continue into adulthood. And there might not be anything wrong with that, even though previous research has indicated otherwise. New research suggests that people who are genetically preordained to be up later than the rest of us might not suffer any setbacks if they are still getting a solid eight hours of sleep every night. So the most important thing when it comes to sleep and your health might not be when you get sleep, but how much sleep you’re getting. If you don’t have a sleep deficit, it likely doesn’t matter when you fall asleep or wake up. For example, I have many friends who work in creative fields. These people tend to be night owls, working late into the evening when they’re hit with ideas. They don’t, however, work until 2 a.m., then wake up at 7 a.m. They tend to get up later in the day, usually around 10 a.m. or noon. They’re still getting a good night’s sleep; they’re just on a different schedule. They’re still respecting their circadian rhythm, and that’s what’s important when it comes to sleep quality and your overall health. A sleep deficit is when problems arise. Every hour of sleep should be made up, largely because your body needs it. A number of processes occur during sleep that are essential for health and your overall functioning. So for every hour of sleep you lose, it’s important to get that rest time back. This is where problems arise for night owls. Unless you live in New York City or another urban center in which nearly everything is available to you 24/7, the world is largely set up for people who wake up around six or seven in the morning and go to bed around 10 or 11 p.m. If you wake up at noon, for example, by the time you get up, start work, and finish you’re really low on options. Things like going to the doctor, getting groceries, and running other necessary errands can be a challenge. For this reason, it might be worthwhile to try to adjust your sleeping to a more regular schedule. But as far as your health is concerned, if you have a regular rhythm and are not sleep-deprived, there is likely little risk in being a night owl. Stick to a regular schedule and make sure you’re getting seven to eight hours of uninterrupted sleep per night. So if you typically sleep from 2 a.m.–10 a.m., stick to it. 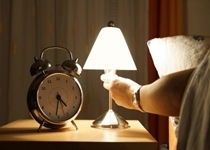 Falling asleep and waking up at different times regularly can negatively impact your health. Try to avoid nicotine, caffeine, and overeating late at night. Keep your room cool and dark: if you’re a night owl, use blackout curtains or a sleeping mask to prevent light from affecting your sleep in the early morning. Take naps to make up for lost sleep if possible, but don’t let these naps interfere with your normal bedtime in the evening. If you’re a night owl, try and find a job that works for your schedule. Inquire about getting a later shift or perhaps a flexible schedule where you could work from home during the hours you find you’re most effective. These practices can help you get a good night’s sleep and stay active and functional throughout your waking hours. Dodson, E. and Zee, P., “Therapeutics for Circadian Rhythm Sleep Disorders,” Sleep Medicine Clinics December 2010; 5(4): 701–715, doi: 10.1016/j.jsm.2010.08.001. “Teens and Sleep,” National Sleep Foundation web site; http://sleepfoundation.org/sleep-topics/teens-and-sleep, last accessed January 6, 2015. Bolster, M., “Is Being a Night Owl Ruining Your Health?” Huffington Post, November 15, 2014; http://www.huffingtonpost.com/knowmore-tv/is-being-a-night-owl-ruin_b_5898098.html, last accessed January 6, 2015.